I often make the joke that everything in my living room was either given to me or cost £75. But on the whole it is true. I had become a member of the property-owning classes at a particularly bad time; I literally made the offer on my flat the night before Northern Rock crashed and set off the recession in 2008. Six months of subsequent wrangling with the vendor over the lease had not helped my trepidation. When I finally moved into my flat the boiler went into meltdown. It was a Good Friday. It was snowing. Luckily a plumber friend of my brother came to the rescue and although I had to temporarily leave my new home as soon as I arrived the plumber was at least able to stop water flowing from the defunct boiler into the neighbouring flats. The upshot, apart from a dramatic arrival for my neighbours, was that my carefully saved ‘furnishing fund’ was sucked into buying a new boiler. People rallied round. My aunt and uncle drove from Wales to bring me a cabinet. My mum and stepdad gave me some antique furniture from the family home, a work friend gave me an armchair. But I had no table, nothing else to sit on and nowhere to store anything. I had already intended to make my flat as eco-friendly as possible and so was looking at the most suitable paint, the best green cleaning products, the most sustainable flooring. The need to make economies then made me look at second-hand furniture. I found a table in a shop in Surrey, price £75. I sourced a storage cabinet on eBay which exactly fit an alcove space in my living room, put in a bid and secured it for £75. Even better the previous owners delivered it for free, despite having to carry heavy oak up three flights of stairs. But I still had only one chair. My sofa requirements were reasonably particular: It needed a high back, I needed to be able to lie down on it, it had to be a sofabed, so I had somewhere to put visitors, and it needed to be cheap. Walking past a local charity shop one day I noticed the window arrangement had been changed to feature a sofabed. It looked the right size, it had a high back and I definitely could lie down on it. 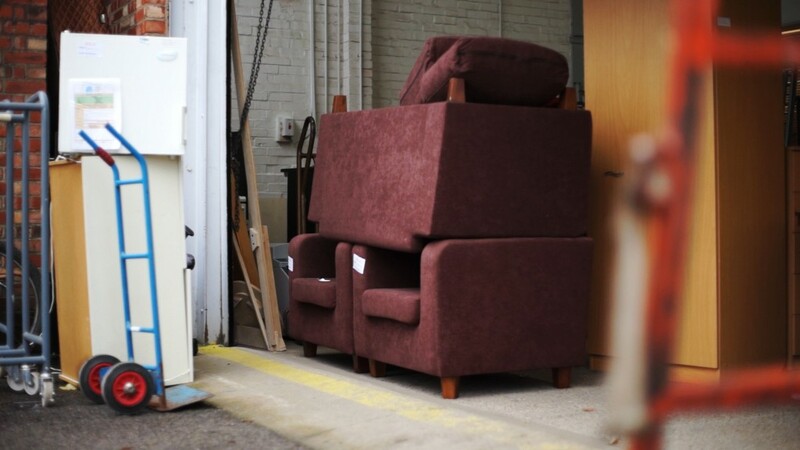 The charity didn’t know the sofa’s back story but it looked harmless enough. When I found out that the price was £75 I knew we were meant to be. Seven years on and the sofa has served well. It has witnessed various parties, as well as evenings alone being lain on to watch films, to read, to sew, to eat, to laugh and to cry. Opened out into a bed it has provided a place of rest for visitors from across the world. Old friends from Australia and China, new friends from Iceland and South Korea, family from France and Greece, all have passed through and remarked on the comfort of sleeping on it. The promise of access to my sofabed in London is an offer constantly made during my own frequent travels. Seven years on and I want to redecorate. I also want a bigger sofabed and so our relationship is coming to an end. But I did not want to cast off my old faithful into the wilderness of the local tip, there’s more life in the old dog yet and so I took some time to consider its future. My friend’s two daughters have just graduated from university and are moving to Brighton and so I offered them my sofa. Not only does this stop yet another perfectly good piece of furniture from ending up in landfill, it makes me happy to think of my sofabed helping the next generation set up their first home. I know it will serve them well.